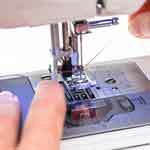 After my recent foray into the world of patchwork quilting I decided to see what was on offer in the way of computerized sewing machines that are good for quilting. I found this excellent budget machine from Brother! Easy to see your stitch selection. 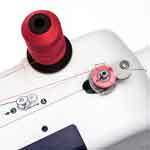 The stitch speed slide button lets you control the speed at which you want to sew. 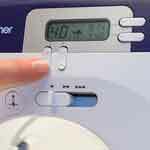 With a numbered diagram written on the machine threading is a breeze! No more fiddling around trying to thread a needle with this handy function. Again, there’s an easy to follow diagram. 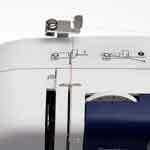 Built-in free arm for sewing cuffs and sleeves. 20 stitches for garment construction. The Brother CS6000i Computerized Sewing Machine comes with all the standard accessories as well as some great extras. • Spring action quilting foot. • Seam ripper, needle set, cleaning brush, screwdriver, spool caps (3), spool pin, bobbins (3), eyelet punch. 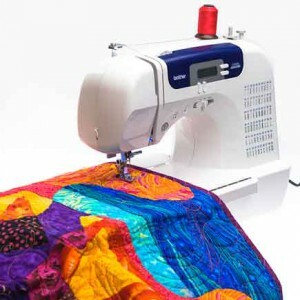 This Brother cs6000i Computerized Sewing Machine is suitable for experienced and beginner quilter with the great quilting features. As well as the oversized table the walking foot makes it smoother to feed multiple layers of fabric through the machine. 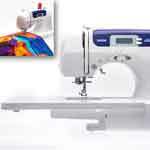 The quilting foot helps you to get more accurate placement of quilting stitches and the quilting guide is for evenly spaced rows of quilting stitches. Last but not least there is a 25yr limited warranty. 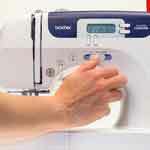 Buy the Brother CS6000i Computerized Sewing Machine here and get crafty! I just have to say wow. I wish I had a Santa to write to! Thanks for sharing.